At St John’s Centre we provide a caring and stimulating crèche facility for your child/children while you attend your course or activity. The crèche can take up to 7 children from the age of 6 months to 5yrs. The crèche is Ofsted registered, and is staffed by trained childcare workers. Thanks to a grant from BBC Children in Need, we are now able to provide 9 creche sessions a week (there is no crèche on Friday afternoon). Please note that places are limited, and there will be a £2.50 per child per session charge for the creche. For further information or if you have any concerns about the crèche facilities, please email Lizzie Quinn, our Crèche Manager, or Christine Aspinall, the Centre Manager, or call them on 0161 872 7795. 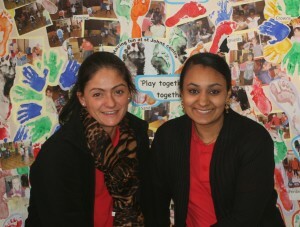 We wish to expand our creche provision in the future to meet an increasing demand. We recently undertook a feasibility study and had plans drawn as part of a capital funding bid to build an extension onto the building, which would enable us to offer 14 places instead of just 7. Unfortunately this was unsuccessful, but we are continuing to seek funds elsewhere. The plans for the extension are available for viewing at the Centre.